Cape Horn to Starboard chronicles college-dropout John Kretschmer’s quixotic voyage to retrace the route of the clipper ships, from New York to San Francisco by way of Cape Horn. This “doubling the Horn,” as it was called, was a formidable challenge to ships exceeding two hundred feet in length, as they routinely battled headwinds of fifty knots and mountainous seas. 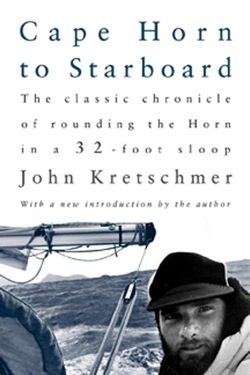 Kretschmer and crew took on the Horn in a 32-foot sloop. This is his story of that voyage. Cape Horn to Starboard is a riotous adventure, a love story, a tale of courage verging on recklessness—and an inspiration for any sailing enthusiast who dreams of sailing out past the far horizon. John Krestchmer is contributing editor to Sailing Magazine and is a full-time bluewater sailor, having logged 286,000 miles at sea—so far. He also writes for Cruising World and Sail. When on land he lives in Ft. Lauderdale, FL.